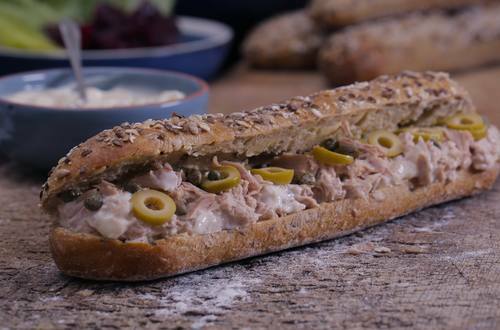 The freshness of the tuna, the saltiness of the capers, grouped with the nautical theme of the submarine roll are balanced by fresh Hellmannâ€™s here. 1 Mix together the Hellmann’s mayonnaise and tuna. 2 Spread Flora over the split roll and top with the tuna mayonnaise. 3 Scatter over the capers and olives and sandwich together. 4 Watch Das Boot. All three hours and twenty nine minutes of it.